I clearly remember my first year of college finals. I was actually 17 and still living at home, it was technically my senior year of high school and I was doing double duty. Finals were brutal! I had never had to stay up late reading or study as many hours. By the time that I finished my finals I was completely and utterly pooped. Baking was one of my favorite activities back then, just as it is now. Second only to eating whatever I bake. So the night that I turned in my last final paper I whisked together the ingredients for pumpkin creme brulee. 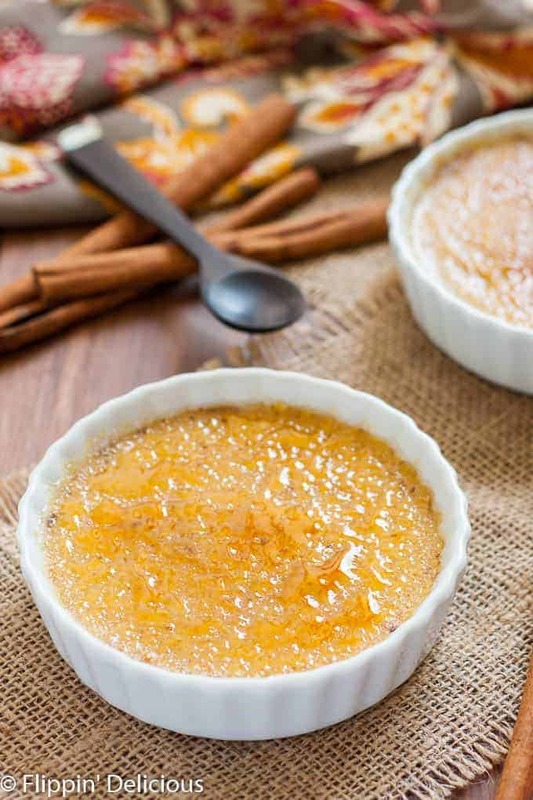 I had always wanted to try creme brulee, and I am a huge pumpkin fan (even though I still love vanilla.) I had picked out a recipe from Food Network months earlier and finally had a spare moment to make it. I didn’t have a kitchen torch, so I popped my custard under the broiler and is basically melted. It was still delicious, but I didn’t get the experience of cracking through the glassy caramel top into the smooth and creamy pumpkin custard. I made another attempt (a very successful one) a few years later when my sister hosted a un-traditional Thanksgiving feast on Thanksgiving Eve. Everyone had other plans for the actual feast, but we still wanted to get together and celebrate. My sister made a stunning prime rib roast and creamy roasted beet soup, and I made mini pumpkin creme brulee to serve as dessert. 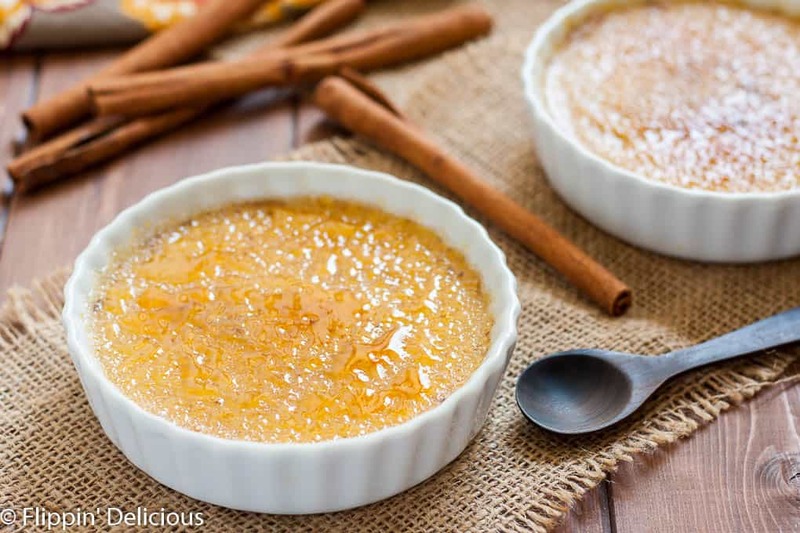 Instead of caramelizing the sugar on each creme brulee individually I made caramel shards to garnish each pumpkin creme brulee. 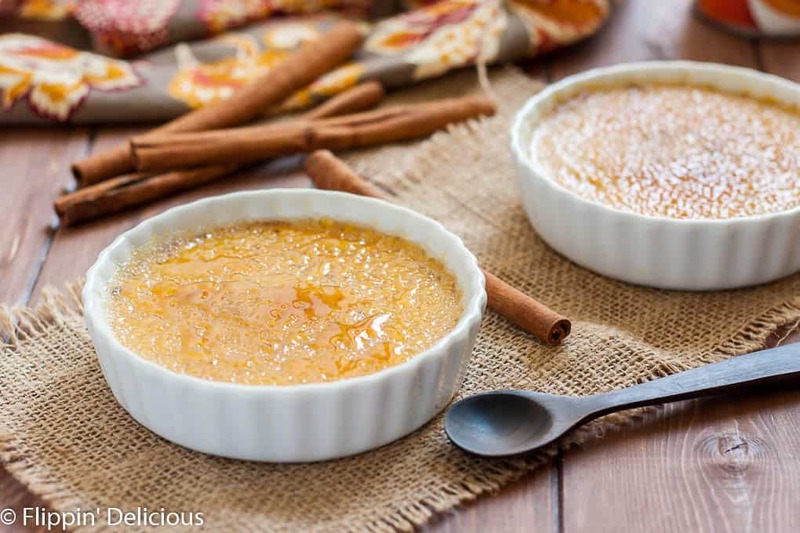 Since our family is currently dairy free I wanted to make a dairy free pumpkin creme brulee for my family (and yours) to enjoy this holiday season. The creaminess comes from using canned coconut milk. 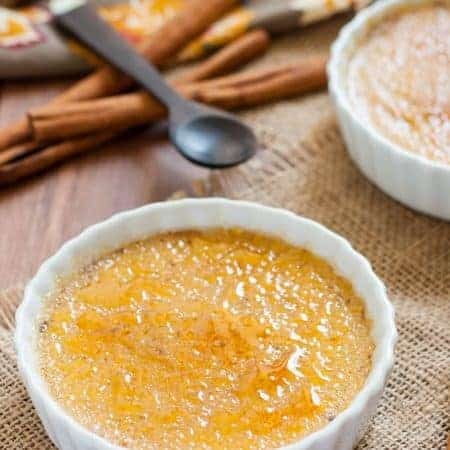 The full-fat coconut milk gives the dairy free pumpkin creme brulee and mouth-feel very similar to tradition creme brulee made with cream. The easiest way to get the caramelized sugar top is to use a kitchen torch. 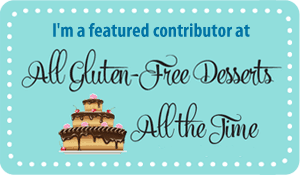 They are relatively inexpensive (and a ton of fun to have in the kitchen.) You can also try putting the custard under your broiler but in my experience it has always melted the custard. You can also make caramel shards like I did for our Thanksgiving-eve feast by carefully melting sugar and then pouring it onto a silicone baking mat and letting it set before cracking it into pieces. 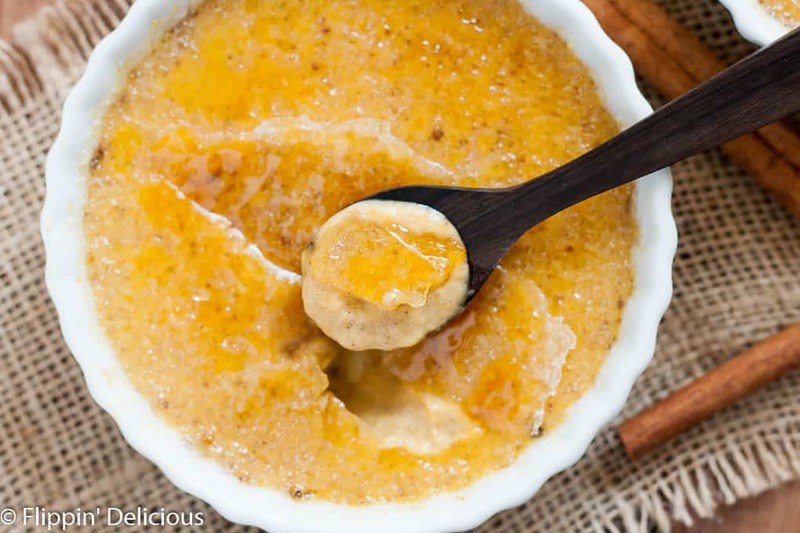 Sweet and creamy Dairy Free Instant Pot Pumpkin Creme Brulee with the iconic burnt sugar caramel top to crack. Easily made in an Instant Pot or your oven. Whisk all ingredients, except sugar for topping, until smooth. Evenly divide the creme mixture between 6 ramekins. Tightly cover ramekins with aluminum foil. Add 2 cups of water to your Instant Pot and place your trivet or steamer basket inside. Pressure cook on Manual for 9 minutes (6 minutes if you make smaller "espresso cup" creme brulees".) Open using Natural Pressure Release. Carefully lift out the custards, they should be nearly solid but still have some good jiggle. Cool at room temperature, uncovered, for 30-45 minutes. Then chill for 3-4 hours or overnight. Place ramekins in a baking dish. Fill the baking dish with hot water so that it comes half-way up the side of the ramekin. Be careful to not splash water into the custards, they won't set. Bake for 40-45 minutes, or until the custard is "set." They should be nearly solid but still have some good jiggle. Carefully remove the custards from the hot water. Cool at room temperature, uncovered, for 30-45 minutes. Then chill for 3-4 hours or overnight. What if I cannot source vanilla paste!? Any successful alternative? I think I included a link to purchase it in the post. 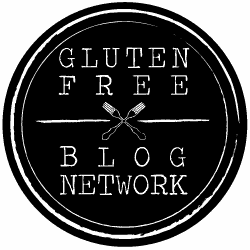 If you don’t have time to wait for shipping, the seeds from a vanilla bean or vanilla extract will work. Vanilla paste gets the same look as a vanilla bean without being as expensive, and both are better than vanilla. However, vanilla extract will work fine in a pinch.